Figure A46. Kabylides anomaly, interpreted as the Kabylides slab, with (horizontal) [vertical] cross sections through (A)[D] the UUP07 p-wave) and (B)[D] the combined SL2013 and S40RTS s-wave models at 270 km; C) the location of the modern geological record that we interpret to have formed during the subduction of the slab. The Kabylides anomaly (Figure 46) is located in the upper mantle below the north African margin of Algeria and was first identified by Spakman and Wortel (2004). It dips steeply, resting on the 660 km discontinuity, and is interpreted as a slab that is detached above 200 km depth. 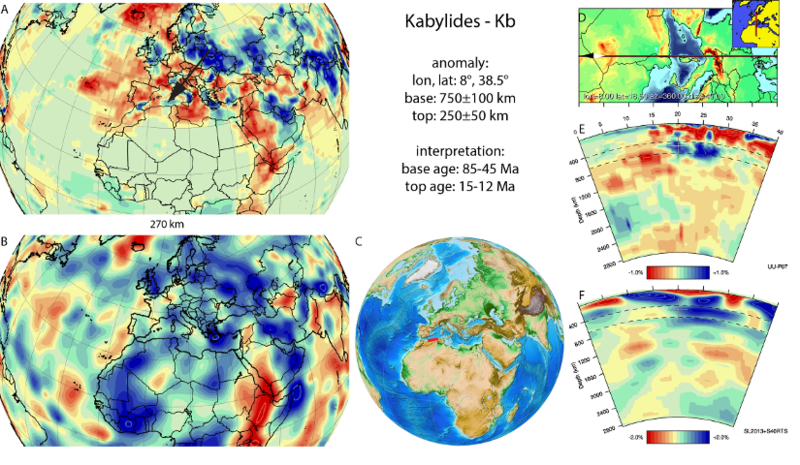 The Kabylides anomaly is interpreted to represent part of the African plate that subducted northward below the Baleares margin since ~85-45 Ma (van Hinsbergen et al., 2014) then still contiguous with the Gibraltar slab. Subsequent roll-back led to southward retreat of the subduction zone, and underthrusting of the North African margin in Miocene time (Michard et al., 2006), followed by slab segmentation and further westward retreat of the Gibraltar slab, leaving the Kabylides slab behind which subsequently detached from the north African margin (Spakman and Wortel, 2004; Michard et al., 2006; Chertova et al., 2014; van Hinsbergen et al., 2014). The age of slab break-off is estimated at 15-12 Ma, inferred from the end of African underthrusting below the leading edge of the European plate exposed in the Kabylides massifs, as well as break-off induced magmatism (Coulon et al., 2002; Michard et al., 2006).